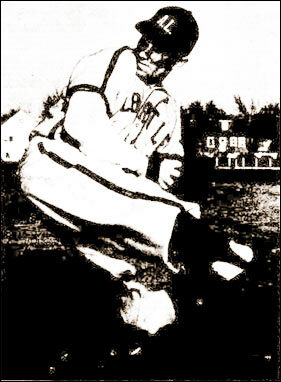 Left and above - Lee Roy "Stumpy" Jones, ace lefty for the Albert Lea Packers of the South Minnesota League. Below - Winona Chiefs celebrate as they broke a nine-game losing streak with a 10-7 win over Waseca. 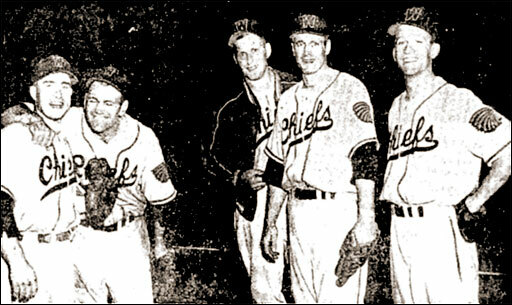 There's smiles all around - left to right - third baseman Billy Leach, first sacker Norm Snyder, Butch Wieczorek, Hugh Orphan, who went the distance on the hill, and right fielder Gabby Hormann.